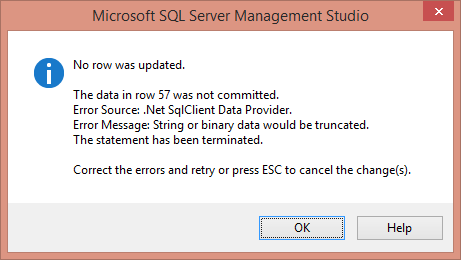 This Error Message Article explains the SQL Server error message “No row was updated…String or binary data would be truncated” and details how to fix the underlying problem that caused it to appear. When inserting a row in SQL Management Studio, this message appears if data inserted does not conform to the data field definition (type, size, restrictions, etc.). Reduce the size of the data or change the table structure to allow more data into the field.